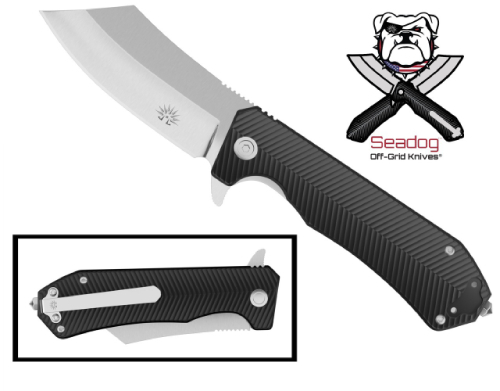 When you choose a reverse Tanto knife, Off Grid Knives guarantee you’ll get the highest quality Japanese AUS8 steel blade, a comfortable tactical grip, and you’ll get it for an affordable price. Why choose Off Grid Knives? We are a small family run business, which prides itself on sourcing the highest quality materials while still remaining a highly affordable choice. With our expert knowledge and experience, we design all our knives in-house and work with our manufacturers start-to-finish on every single knife we sell. Cost is also very important to us, so we have spent a great deal of time sourcing manufacturers who can enable us to offer you affordable knives that still maintain a high standard of craftsmanship and use high-grade materials. For our reverse Tanto knife range, we use the highest quality Japanese AUS8 steel and offer a lifetime replacement guarantee on every knife sold. All you need do if your knife fails is contact us on our website, and we will send you a new one. Choosing Off Grid Knives for your next purchase will ensure you get the best knife for the price. This is why our clients include the U.S. Military, law enforcement agencies across the country, fire departments, and EMTs. What will you get from a reverse Tanto knife? Each knife features a razor-sharp blade made with the highest quality Japanese AUS8 steel. During the manufacturing process, the blade is cryogenically treated, then cooled to -321 degrees with liquid nitrogen. This process ensures your knife will stay sharper for longer, as the wear resistance of your knife will have increased many times over. Every knife in this range features an ergonomically designed tactical grip that will give you solid and precise movement, and easy in-out storage from your pocket. The knife will also feature a one-click flip trigger allowing you quick access to your knife. We are passionate about what we sell and are always looking for ways to improve our products and customer service. Contact us today if you have any questions, suggestions, or concerns about purchasing our products.